Snipsnap offered multiple look and feels and for the advanced CSS coder, offered many opportunities to manage itl. My changes were relatively simple. In fact it might have been Snipsnap that took me to Blue Robot which influenced me a lot. On the previous bliki, implemented in Snipsnap, I implemented a Green Robot Theme. This was based on Blue Robot, which rather inspired me as you can see if you read the code and comments of what remains of http://davelevy.info. 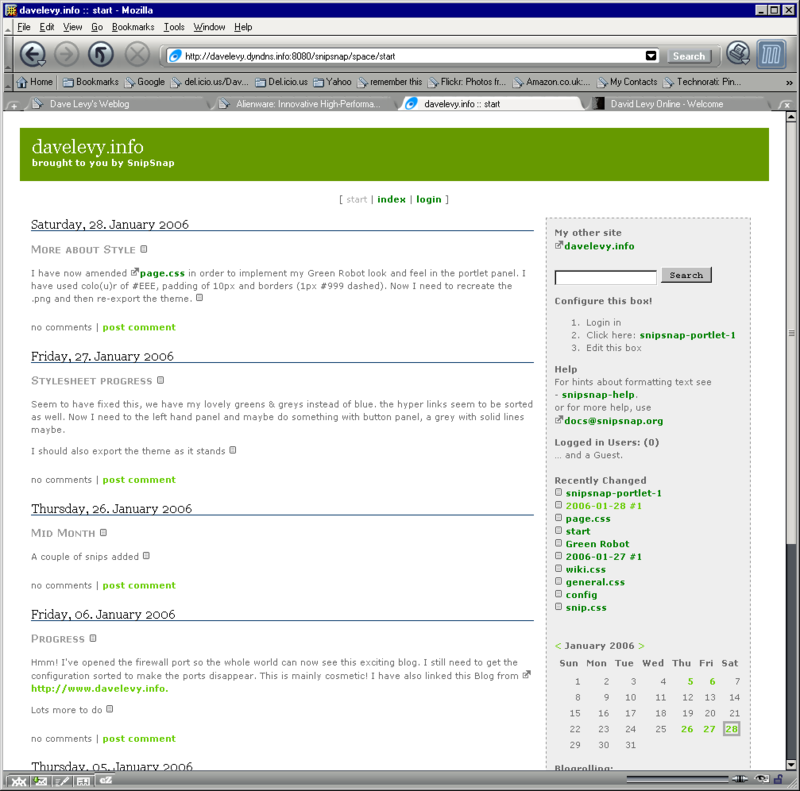 I should also capture some comments on the CSS used by Snipsnap, it is/was a good looking blog in my opinion. It used Georgia as a serif font, and Verdana as the sans-serif font. It’s basic content was san-serif , and the blog headings and dates used the Georgia font. The full css can be found on the snipsnap site. The picture above suggests that when the blog comes across, some of the articles there, will document the progress and discoveries made as at the time, which it seems was 2006. It’s getting to be a long time ago.